As of this morning, we don’t have too much going on for weather as all games in terms of game time weather are concerned will be at 60 degrees or higher. That said, in Tennessee we have some expected drizzle for the game and up in Foxboro, it is raining as of 10 a.m. EST. It is expected to stop for the Pats/Jets game. For more information just come here. In this section, we look to give you some insight as to who the public is taking by majority for FanDuel and DraftKings this week. 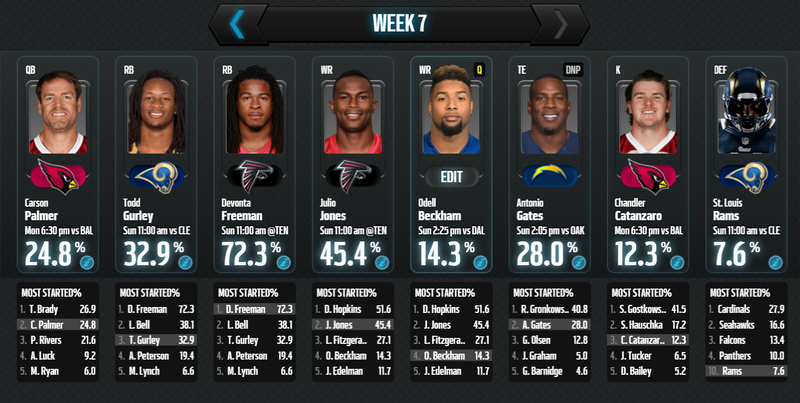 Given that FanDuel and DraftKings aren’t allowed to distribute this information until after the games have started, we pull this information from nfl.com and their perfect lineup challenge. Some key information here this morning as you look to set your final lineups for today’s contests is the simple fact that recent news has slated Antonio Gates as a game-time decision. He apparently had an MCL sprain in last week’s game while no attention was given to this injury until late Friday afternoon and now you are stuck with having to decide should I play him or not. If you play multiple lineups, he is worth leaving in one for FanDuel. On DraftKings, the nice thing is you can wait until you know and then you can take him out if you need to if he ends up not going. If he doesn’t go, your options should either be to roll the dice and go with Ladarius Green or you transition to Witten as the Giants are just as terrible about giving up points to the TE as the Raiders are. As you can see we stayed away from Palmer in our expert picks but that is only on a few lineups, we will be playing him on a couple of others. You should roll with the hot hands of Freeman and Hopkins if you can and a cheap but good play is Diggs from Minnesota. Come check out the rest NOW. Tryout our Silver Membership today and you will get a 7 day free trial so you will get this week and next week to build your lineups with our custom information. Enter Promo Code WORD1 and receive an extra 50% off your first month!